Nexor is part of a consortium that has secured more than £4.2 million of funding from Innovate UK and the Centre for Connected & Autonomous Vehicles (CCAV) to deliver a pilot scheme that could pave the way for the use of connected and autonomous vehicles to move people around airports, hospitals, business parks, shopping and tourist centres. Comprising 20 partnering organisations, the AECOM-led CAPRI consortium brings together academic institutions, businesses, SMEs and public sector authorities with a range of skills, knowledge and needs in the Connected and Autonomous Vehicles (CAVs) arena. 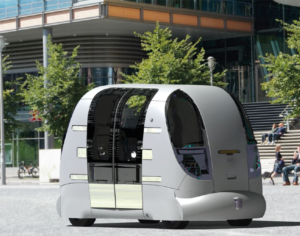 The project will include the development of the next generation of PODs, as well as the systems and technologies that will allow the vehicles to navigate safely and seamlessly in both pedestrian and road environments. “The race for developing connected and autonomous vehicles is accelerating and as a Government we are determined to build on our strengths and ensure the UK is at the forefront of this revolution. The project includes four trials, with the first on private land at Filton Airfield near Bristol where consortium member YTL is developing a major new community. The aim of this trial will be to test and validate the performance of the new generation PODs. The second trial will test a public service in a shopping centre car park to assess performance in busy pedestrian areas. The final two trials will be at the Queen Elizabeth Olympic Park, a large and diverse estate that includes retail, recreation, residential and business centres. The first of these trials will test a public on-demand mobility service in pedestrian areas, with the PODs identifying and navigating the best routes. The final public trial will test the PODs on a network of roads around the park, with the service interacting with traffic control systems. An important aspect of the scheme will be safety and security. For the first time, the project will apply accidentology analysis to PODs to identify potential causes of accidents that will require testing and evaluation in the real-world, while using state-of-the-art techniques to simulate other scenarios, therefore reducing the need for real-world testing. The consortium will also undertake a system-wide cyber-physical security analysis to identify how to protect the POD systems from being compromised. CAPRI (Connected & Autonomous POD on-Road Implementation) is a large consortium comprising 20 partnering organisations. With a strong mix of academia, business and public sector authorities, each member will play an important role in the delivery of the CAPRI mobility service pilot scheme. The 20 CAPRI partners are: AECOM, AXA, Burges Salmon, Conigital, dynniq, ESP Group, Fusion Processing, Heathrow, Loughborough University, Nexor, Queen Elizabeth Olympic Park, South Gloucestershire Council, Transport Simulation Systems, University of Warwick, University of Bristol, thingful, TVS, University of the West of England, Westfield and YTL. For more information download the CAPRI leaflet.